Hamburger Viola doll, 24" tall, bisque socket head, jointed composition body, mohair wig, feathered eyebrows, sleep eyes, real upper lashes, painted lower lashes, open mouth. 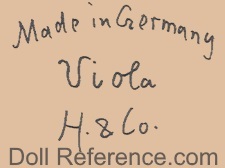 doll mark shown above left, Made in Germany Viola H & Co. 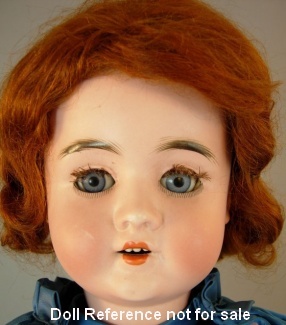 Hamburger and Company was founded in New York City in 1889 as an importer and distributor of dolls and toys, some time later they expanded with offices in Berlin and Nuremburg, Germany as well. 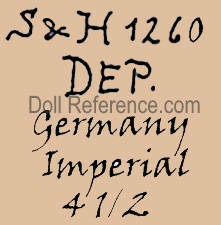 Hamburger registered doll names are; in 1893 D.P. 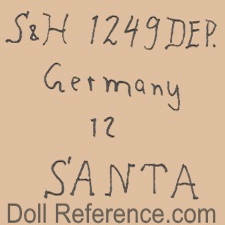 and H & C, in 1898 Imperial, in 1900 Santa doll molds 1248 and 1249 made by Simon & Halbig, it's also possible Gebrüder Heubach's Santa marked dolls were made for Hamburger, in 1901 Imperial H & Co. a line of kid bodied dolls, in 1902 Marguerite doll and Old Glory dolls made by Adolf Wislizenus, in 1903 Viola doll which often includes the company initials (H & Co.) in the marking. In 1903 Hamburger advertised portrait dolls of Lula Glaser as Dolly Varden and Lillian Russell. 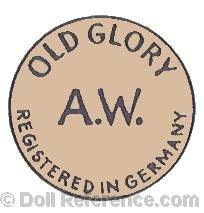 They advertised in 1905 Brownie Policeman jointed dolls, covered in wool and silk plush and in 1907 Dolly Dimple doll mold 5777 and 9355 made by Gebrüder Heubach. 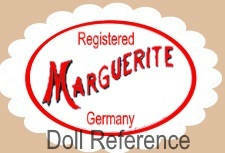 Hamburger & Company (distributor) doll mark Marguerite Germany label, bisque head made by Edmund Ulrich Steiner marked EUst. 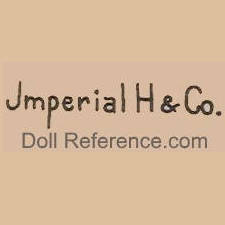 Note: In 1894 Hinricks & Co. also registered a H. & Co. doll marking.